One of our favorite products on the site this year are the handmade Hanukkah cards by Sari Victoria. 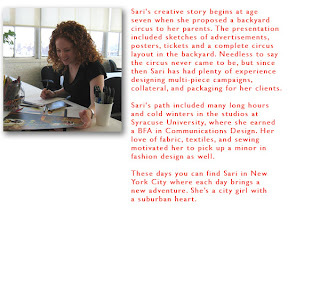 Sari is a multi-talented graphic designer based New York who was dismayed at the lack of cool Hanukkah cards on the market. (Have you noticed how card shops devote a whole aisle to Christmas cards but barely have anything for Hanukkah?!) 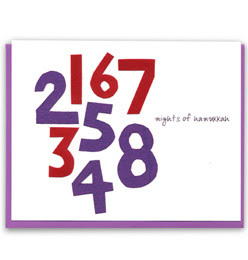 Not one to sit around on her tuchus, Sari came up with her own line of fabulous Hanukkah cards. The cards are all handmade using scraps of felt and paper from Sari's own craft bin. Her cards currently come in two styles the 8 Nights and the Festival of Lights. Another favorite site of ours is Etsy.com. Etsy is a virtual marketplace filled with handmade goods. Look and you might find some other cool handmade Jewish items. Esty also recently posted this fun interview with Heeb Magazine's editorial director.